You can become more sensitive to carbs in your menopausal years. Combined with a sensitivity to stress and it easily leads to an expending waistline which is hard to reduce. ‘Eat less, exercise more’ no longer works and often has the opposite effect, or so it seems. Sugars have the least tolerance to carbs and therefore have to be quite fussy with the amount they eat. Also if you have limited bites, the food has to be fabulous otherwise why bother! If it’s a treat then 3 bites or 5 bites if it’s healthy. It doesn’t sound much but speaking from experience it’s actually easier to keep a track of compared to a higher number of bites. If you are going to the gym, you will need to fuel your muscles afterwards whilst keeping in your range of bites. This is when I would plan to eat starchy carbs that I would enjoy, rather than eat them on days that are sedentary. If you are reducing your carbs it may impact your sleep and may wake you up in the wee small hours. Ensuring you have enough carbs in your main meal of the evening can help with this. Which is trial and error on your part to work out what works best for you. Click here to use the calculator on my website. The GI Index and diet was created for people with type 2 diabetes who wanted to control their diabetes with food rather than medication. 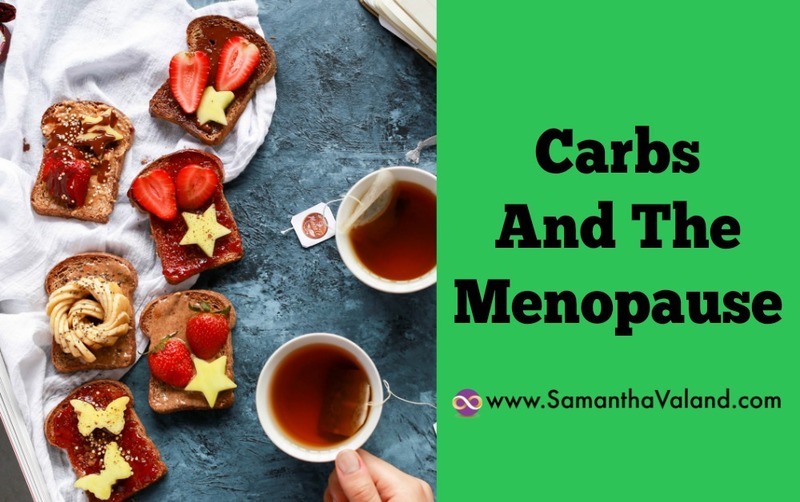 It can be a useful guide in your menopausal years if you are sensitive to carbs to work out what foods are everyday foods and which ones are occasional ones. A food diary is a great place to start. We can often be quite habitual with our food habits. I have oily fish on Tuesday and Fridays, which are meat free days. I check my diary and when I am teaching Pilates classes as it is often at an anti-social time. I encourage you to start looking at how food makes you feel afterwards. Regardless if you head is telling you it is healthy, what is your body telling you? We can pick this up from our hunger, energy and cravings levels. HEC for short. If you are hungry a few hours after lunch, then you need to look at the combination of protein, fibre, carbs fat on your plate. Click here for a free Food Diary to download. Carbs split into two groups of starchy and non-starchy carbs. Non-starchy carbs are the ones we can be a bit more relaxed with. Starchy carbs, we need to pay a bit more attention to. We tend to know the obvious ones such as alcohol, biscuits, pastries and crisps are in the occasional category. However, some fruit and veggies also fall into the occasional category, particularly for menopausal women. High sugar fruits such as cherries and watermelons, and veggies such as butternut squash and sweet corn. Food diaries are useful for spotting where the veggies and carbs in your meals are both starchy or is it a split between starch and non-starch on your plate. Unfortunately, this part of your menopause doesn’t come with a manual, so it is really up to you to play around with the ratios on your plate and keep note of how it makes you feel.